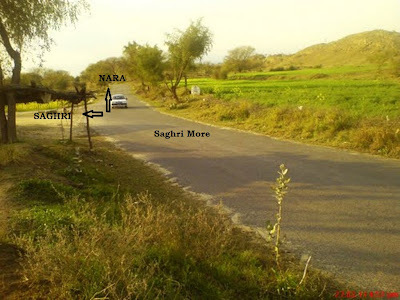 History, Culture, Environment, Economy, and Cuisine of Village Nara (ناڑہ), Tehsil Jand, District Attock. | Village NARA (ناڑہ), Tehsil JAND, District ATTOCK. History, Culture, Environment, Economy, and Cuisine of Village Nara (ناڑہ), Tehsil Jand, District Attock. It’s a developed village, located in the south western part of Attock district. It is 117 kilometer away from the federal capital, Islamabad. It is situated at the border between the Punjab and Khyber Pakhtunkhwa province of Pakistan. The mighty Indus River (دریائے سندھ), with its full might and fright, separates both the provinces. It's approximately 5 kilometre away from the village and if you're in the mood for fun and frolics then this Indus River is a worth-seeing spot. Administratively, my village is a union-council of five other surrounding villages: Pari, Dandi Jiswal, Kundrala, Jalwal and Mari. Some of the prominent mohallahs(populated areas or colonies) of the village are: Mohallah Tamman, Mohallah Ziarat, Mohallah Tairha Shirqi, Mohallah Ma’ian Sehna, Mohallah Bazar, Mohallah Lunger Khana, and Mohallah Tappa. Population of the village is around thirty-five thousand to forty thousand inhabitants. 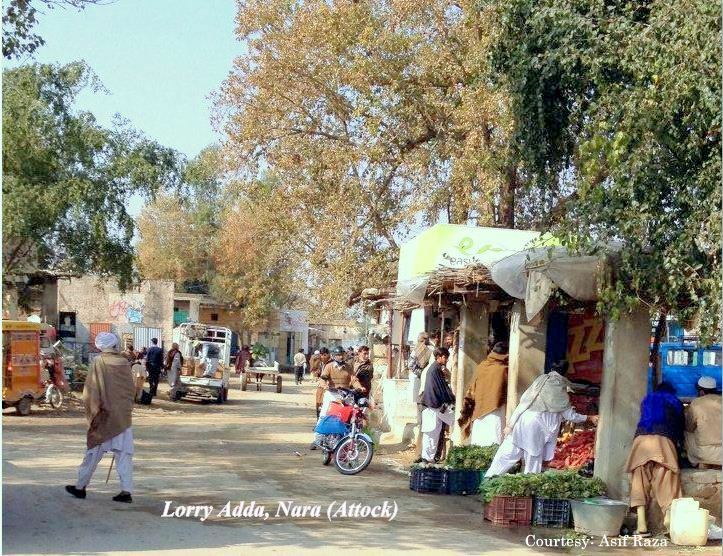 This village has a prominent place in the politics of the Attock district. It’s a renowned village at district level. Natural resources (oil and gas) are being extracted from Maari and Jalwal Oilfields which fall under the jurisdiction of Nara Union-Council. Etymologically, the word ‘NARA’ has been derived from Nar ‘نڑ’ which is a bamboo variety. The size of its stick is 10-15 feet in length and 1-1.5 inches in diameter. The area was lush green with this bamboo variety. That’s why, the village was named ‘NARA’. Some 30-35 years back, there was an abundance of water in the form of lakes, flowing streams, and ponds. Unluckily, the level of under-ground water has gone down nowadays. The area was used as an avenue for military excursions in India by various Arab, Pashtoon, Iranian, and Central Asian martial races. Their traces can be found in nearby mountains’ range in the form of demolished forts and ancient graveyards. Long before that time, the area was used as a gateway for mobility between Taxila and the Central Asian States by the Budha followers. Hindu traders exploited the geo-political location of the area and many of them settled here. Their remains can be found in the center of the village in the form of multi-storey buildings and some ancient Hindu temples (Dharamsaala). One such Dharamsaal in torn condition that you can visit is in Mohallah Ma'ian Sehna. Immediate after the partition announcement, the Hindus had to emigrate to India. Some of their buildings have been demolished by the Indian Punjabi and Kashmiri migrant allotees, locally known as Muhajirs. One of the buildings has been renovated and converted into a private hospital. Muhajir community settled here after the partition of Indian subcontinent in 1947. Ethnically, the inhabitants of the village can be divided into three groups: local Indians (Jats, Bhatti Rajputs, and Janjua Rajputs), Arabs (Awans, Khattar Awans, and Fatimid Syeds), and Afghans (Khattak and some Bangash Pathan families). According to the Punjab Districts’ Gazetteers, Awans (also known as Alvi Syeds) got hold of the area after driving Janjua Rajputs out of the Salt Range. Khattars are the mixed race of Awans and Jats. The differences among these groups are almost non-existent because of inter-marriages and Islamic concept of equality. During pre-partition era, the British government of India heavily recruited army men from this area because of the bravery and valor of the local men. Some oldsters of the village also participated in World War I and World War II. Some of those veterans are still alive. According to the Punjab Districts’ Gazetteers, the then Sikh emperor of Punjab Maharaja Ranjit Singh convinced local chiefs of Tehsil Jand, mainly Maliks and Khans, to send armed men to crush the Mujahideen Movement, led by Syed Ahmed Shaheed in Balakot. As a return, the chiefs were awarded with thousands of kanals of land and other land revenue concessions. Mr. Abdul Maalik, the brave man, who got hold of the Indian plane hijackers in Seventies, belongs to a nearby village, Kot Chajji (کوٹ چھجی). The PIA flight from Islamabad to Muscat was being hijacked to India. As a reward of Mr. Abdul Maalik’s utmost bravery, the then President General Zia-ul-Haq provided all modern facilities to Kot Chajji village. The construction of Nara-Jand Road is attributable to this brave man, Abdul Maalik. Environment of the village is very clean. As long as flora and fauna of the village is concerned, the following species of birds are commonly seen in the village. Jujube Fruit trees (بیر) are very common in the village. They are found everywhere, in home gardens, across the roads and paths, and in forests. In hot summers when temperature exceeds 450C, simple people of the village like to take rest under the shade of these Jujube fruit trees.This Jujube fruit (بیر) has an exceptionally long list of health benefits. Jujube contains the potassium, phosphorus, manganese and calcium as the major minerals. There are also high amounts of sodium, zinc, iron and copper. Jujube also contains vitamin c, riboflavin and thiamine. It contains 20 times the amount of vitamin C as citrus fruits. The vitamin and mineral content of the fruit helps soothe the upset stomach, eases sore throats, suppresses appetite, supports cardiovascular health, enhances metabolism and cleanses blood vessels. It’s mainly a rain-fed area. Persian water wheels (رہٹ), using cows and bulls, are still in use to irrigate crops and vegetables. Some of the land is irrigated by tube wells as well. The land of the village is very fertile. Farmers of the village grow vegetables and crops. Arable land of the village is very fertile and small-scale conventional fruit farming is common in the village. There is a huge potential for large-scale cultivation of different species of fruits and vegetables in the village. But due to lack of entrepreneurial skills in the village inhabitants and centuries-old horticultural practices, this potential isn't being tapped. Despite advancement in agricultural machinery, around one per cent of the village farmers still plough their land with the help of bulls and cows. Wheat, peanuts (مونگ پھلی), corn, maize, millet, grams and pulses are some of the main crops. Economy of the village is mainly agri-based. 'Bazaar' is the center of business activity in the village. Mong Phalli (Peanuts) is considered to be the cash crop by farmers. During its season, market economy of the village revs up abruptly because of the higher circulation of money in the market. Wedding ceremonies are scheduled after this season. Paraphernalia for weddings is purchased. Livestock is another important source of income and employment in the village. It contributes to household income besides assisting crop production. 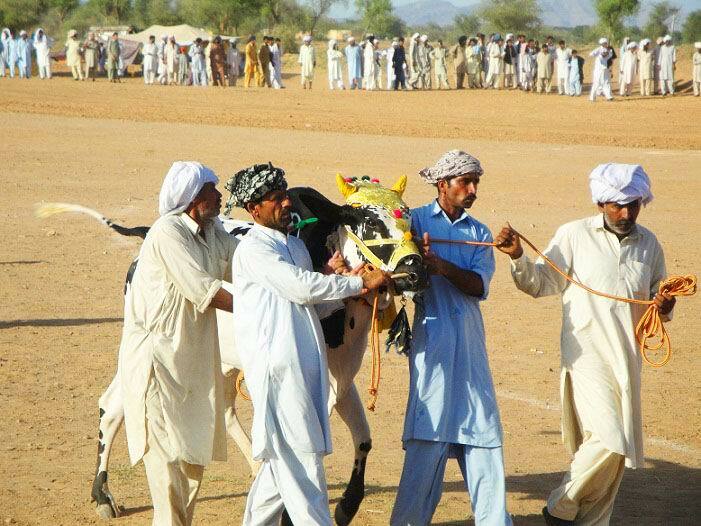 ‘Domel Mandi’ is the nearest livestock market in the area which is held every Friday in Domel village. A government veterinary clinic is providing veterinary health services to facilitate farmers of the village. There are more than twenty masjids(mosques) and an Imam Bargah in the village to quench the spiritual thirst of the village inhabitants. Most of the village dwellers follow Sunni Hanafi school of thought of Islam. Barelvi Sunnis, Deobandi Sunnis, and Shias have exemplary relations in the village. All religious festivals are celebrated with religious fervour. People of the village feel comfort in shalwar kameez and it’s a common dress code. Most of the men have huge moustache. The number of clean-shaven men in the village is few and far between. A local language, quite similar to Hindko, is widely spoken by the village inhabitants. Some people of the village are bi-lingual. They speak Pashto as well as local Hindko dialect. The same language, with slight variations, is spoken in Tehsil Talla Gang of a neighboring district Chakwal as well. ‘Berballa’ is a traditional folk dance which is performed only by men on dhol beats at weddings and other festive events. It resembles Khattak Dance in some respects. Chacha Jewna (چاچا جیونہ), now in his late sixties, is the most experienced dhol player in the village. Sa'in Sarwar (سائیں سرور) is one of the most exotic and exhilarating dancers of Berballa in the village. (please stop embedded FM Radio Station and Geo News TV before playing these videos). Bull Race events are held to entertain the village inhabitants. Annual Urs events in masjids and and melas at shrines are some of the other events of entertainment for the village inhabitants. Being an agricultural society, the village is self-reliant in the supply of basic ingredients for food. People of the village have a very simple naturophilic lifestyle. Like you'll find roasted ears of corn in every household during its harvest time. In the same way, you'll find makeshift mobile food stalls, selling roasted kernels of corn and roasted grams in the streets. These roasted grams are fat-free crispy and crunchy snacks. Honey melons and water melons of Rattian Dhokan, Dhok Uchri, Dhok Chhoi, Dhok Jaaba and Kundrala are very sweet. They taste like honey and when opened release a fragrant aroma. If you want to tickle your taste buds, Pakoras (potato dumplings, fritters) and Samosas (a triangular stuffed pastry) of Fazal Ilahi and Chacha Sufi are quite famous in the village. Lip smacking home-made Cholay or Chana Chaat (chickpeas) of Shafique and Naseer are quite delectable as well. Both of them run their makeshift food stalls. Generally, chicken curry is served with roti in wedding meals. Makhadi Halwa (مکھڈی حلوہ, a sweet) is served as a dessert. This halwa is a specialty to this area. Local chefs are very good at making these dishes for hundreds of invited guests at wedding receptions. Maki ki roti (corn flour bread), Saag (curried spinach), Sarson ka Saag (mustard greens), and Lassi (curd shake) are among the favorites. Lassi is a common drink in summer. A traditional way of making lassi in the village. A traditional butter churn is operated by pulling the rope to spin the paddles inside an earthen pot. Desi Ghee (clarified butter), due to its rich flavor, is still considered to be an important part of the traditional rural cuisine in Nara. Methi (dried fenugreek leaves) are sprinkled over chicken, beef, lamb, and vegetable curries to give them an awesome flavor. There are more than 15 government schools in the village. A higher secondary school (Govt. 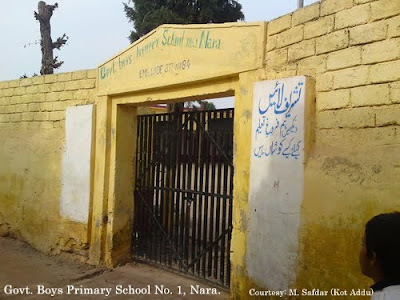 Higher Secondary School, Nara) up to intermediate level is also imparting education to the boys of the village. The literacy rate among the village inhabitants is around 70 per cent. Educated individuals of the village are more interested to be employed in services sector nowadays. At present, majority of the men of Nara village are employed in different ranks and files of Pakistan Army, including some army officers. People of the village are very brave, hard-working, and industrious. Some 4-5 families of British Pakistanis are contributing positively in the pro-development activities of the village. Their contribution in sending remittances back home and their role in education sector is applaudable. ‘Lorry Adda’ is the main bus stop in the village. Most of the commodities are transported from Rawalpindi/Islamabad, Attock and Jand. Seven coaches and a Toyota Hiace service connect the village with Rawalpindi/Islamabad via Kohat-Fateh Jang Road. And a local van (wagons) transport service connects the village with Attock city via Kala Chitta Mountains’ Range. There is a post office branch ‘Daak Khana’ which caters to the needs of not only Nara village but other adjoining villages as well. People of the village rely upon only one financial institute for their fund-deposits and withdrawals. There is only one MCB (Muslim Commercial Bank) branch in the village. Efforts to connect it with other branches, for online inter-bank and intra-bank transactions, are under-way. The village dispensary has been upgraded to a rural hospital. 3-5 private clinics are also providing health care facilities in the village. Private health care professionals are either homeopaths or quacks. The electricity was provided in 1964. Internet usage in the village is less than one per cent. Teledensity ratio in the village is around 75 per cent, including 5-7 per cent landline telephone subscribers. The initiative was taken by Pakistan Telecommunication Corporation Limited for landline services. There are towers of four telecom operators in the village namely Telenor, Mobilink, Ufone, and Zong. Though the signal strength and overall service quality of almost all telecom operators is pathetic one. In short, my village is a paradise on earth, with a very cosy and hospitable environment. There is peace and tranquillity in the village. I'm very proud of my village, its people, and its peaceful environment. Bash Malik (Hemel Hempstead, UK). Watermark theme. Theme images by Barcin. Powered by Blogger.